Cold is coming. That’s what the meteorologists say. Never mind that it's only the second week in September and that most everyone in the Upper Midwest is near panicked about summer's end. Nope. Weather don't care. A Canadian cold front is coming in with a left hook. Highs in the 50s with a cold rain, they predict. Gray. Maybe even frost in the outer suburbs. Teach us to number our days of sun, Lord, that we may gain a heart of wisdom. The dire forecast certainly sent a tingle of terror down my spine. But more than that, it gave me permission to wallow in the last few days, which were perfect to the point of myth. Blue skies, crisp breeze, bright sun that caressed my skin with warmth. “There, there, baby. I’m not gone yet.” The purple and orange coneflowers hosted a honey bee frat party, and the pool was filled, one last time, with laughing, splashing children. It was glorious. And I relished it more because I knew it was about to change. This is the lesson of the seasons: change is constant. So you best keep your eyes wide open for the gift of today. My kids started school last week. 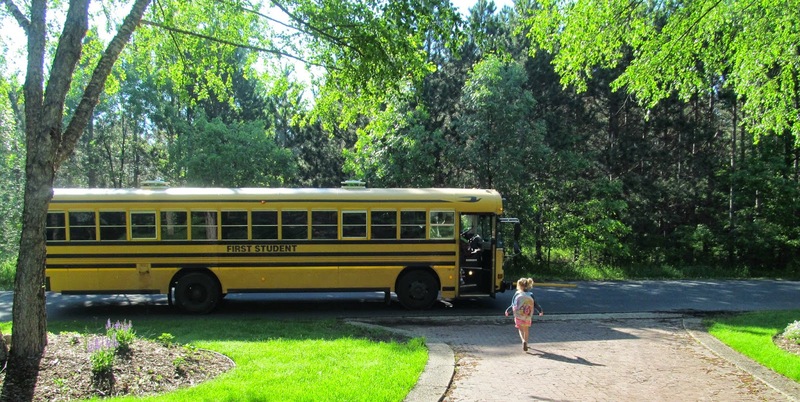 There was the normal adjustment: Teyla started first grade - she's gone all day now, riding the big yellow bus to and from school with her older brother - and Kieran is in preschool three mornings a week. But for the most part, this is a well-worn groove. We know this dance. We all get up between 7:00 and 7:30, we leave the house at the same time each morning. I know every possible route to Natalie's private school, I can guess what each child wants for lunch. Everyone gets home around 4:00. It's safe. Predictable. But I see signs of change ahead. Next fall, Natalie starts high school, and a public high school at that. Connor will transition to middle school. And Kieran, my baby, will start all-day, everyday kindergarten. Whew. Left hook to a momma's heart. That's a lot of transition coming for me in 2015. Good stuff, even great stuff. But all of it involves heaping piles of change. Which is why I'm savoring this year, The Year Before. I'm 42 now. I have experience with seasons. I have learned to step back and use all my senses to treasure today. Natalie, tall and tanned, embracing her new role as oldest on campus. Basking in her last year with her friends before the high school diaspora. Connor, relaxing in to his second year at his new school. Deepening friendships, growing comfortable with routines and expectations. Teyla, delighting in first grade and the new friends and the new teacher. For her, it's all discovery and giggles. Even Kieran, dipping his toes in the educational pool and then happily joining me back at home, where he can snuggle and play guys and do karate without a single distraction or care. I've said before, these are the good days. I know it. And this year, I'm savoring it. Open wide my eyes. Listen. Laugh. Drink it all in, every last bit. Because I love every season. But the one I'm in is always my favorite.